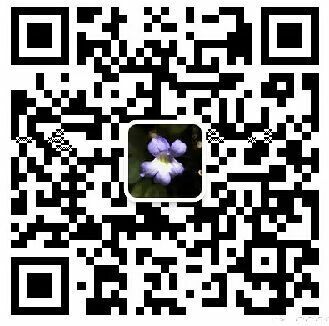 The newly refined genus Petrocodon Hance (Gesneriaceae), mainly distributed from southern to southwestern China, is comprised of 33 species and one variety. 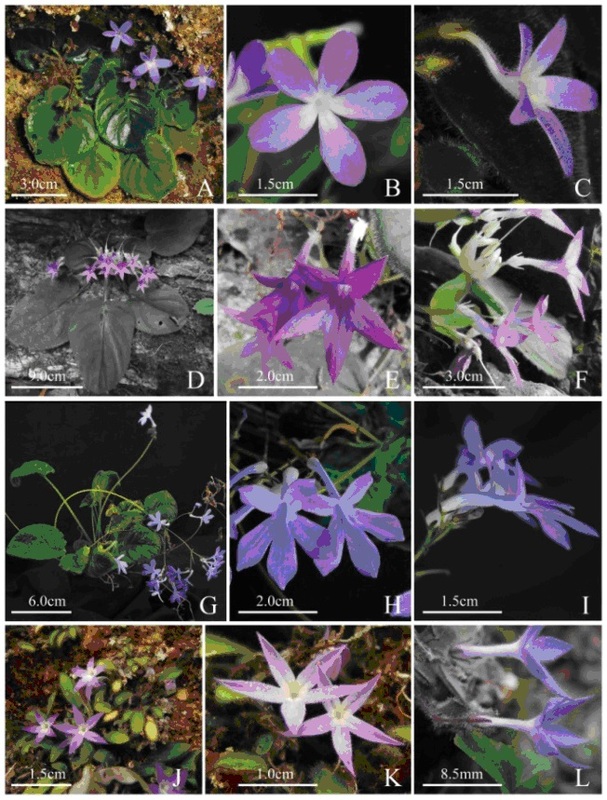 A new species, Petrocodon tenuitubus W.H. Chen, F. Wen & Y.M. Shui, distributed in the limestone region from Maguan County, Yunnan province, China, is illustrated and described here. The new species is similar to Pet. lui, Pet. hispidus and Pet. jasminiflorus, but it can be easily distinguished from Pet. lui and Pet. hispidus by its slender and curved corolla tube, 3 linear to lanceolate bracts and bracteoles, and one disc-shaped stigma. And it also can be easily distinguished from Pet. jasminiflorus by its ovate to orbicular leaves, ovate corolla lobes with obtuse apex, bracts and bracteoles 3, and staminodes 2. The holotype and paratype specimens are hold in Herbarium of Kunming Institute of Botany, Chinese Academy of Sciences (KUN); isotype specimens is deposited in Herbarium of Guangxi Institute of Botany, Chinese Academy of Sciences (IBK). Figure 1. Petrocodon tenuitubus W.H. Chen, F. Wen & Y.M. 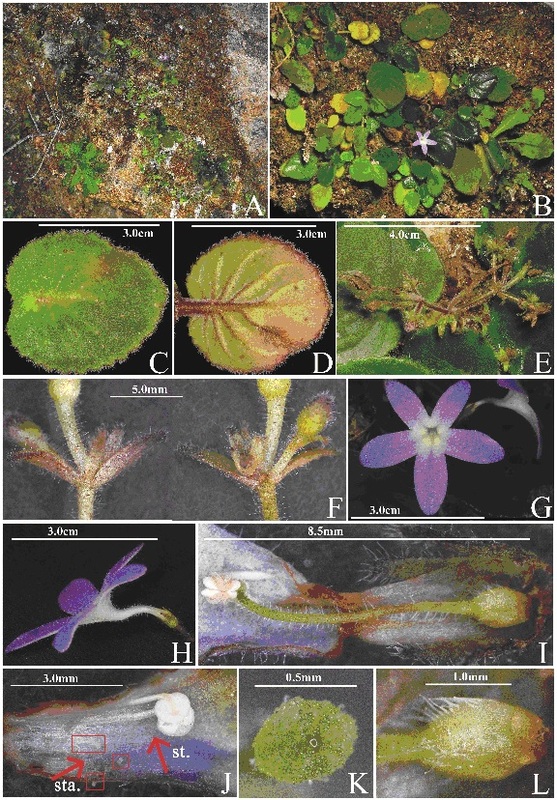 Shui: (A) habitat, (B) whole plant, with flower, (C) leaf adaxial side, (D) leaf abaxial side, (E) inflorescences, (F) bracts and bracteoles, (G) flower, front view, (H) flower, lateral view, (I) opened corolla, showing stamens and pistil, (J) stamens (st.) 2, confluent apically, and staminodes (sta.) 3, (K) stigma, (L) ovary. Photographed by Shi-Wei Guo (A, B, E, G and H) & Li Chen (C, D, F, and I–L). Figure 2. Petrocodon tenuitubus and its morphological related species, Pet. hispidus, Pet. lui and Pet. 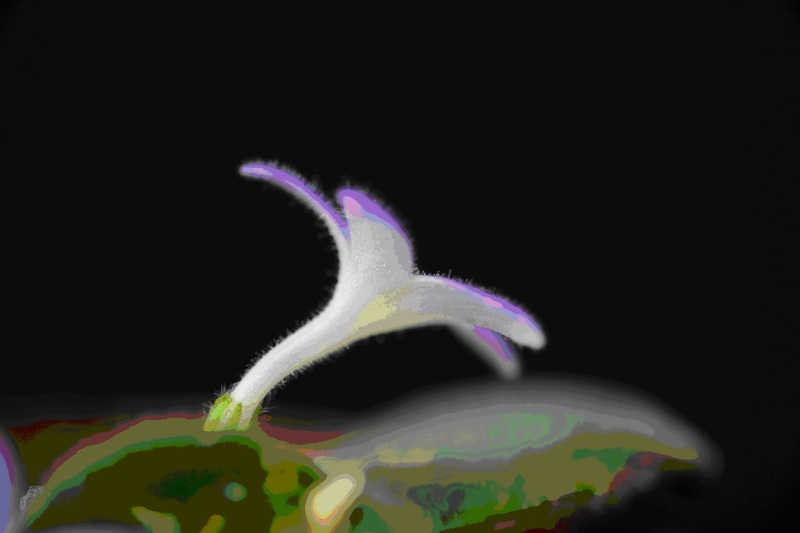 jasminiflorus. (A–C)Pet. tenuitubus : (A) habit, (B) frontal view of flower, (C) lateral view of flower; (D–F) Pet. hispidus : (D) habit, (E) frontal view of flowers, (F) lateral view of flowers; (G–I) Pet. lui : (G) habit, (H) frontal view of flowers, (I) lateral view of flowers; (J–L) Pet. jasminiflorus : (J) habit, (J) frontal view of flowers, (L) lateral view of flowers. Photographed by Shi-Wei Guo (A and C), Peng-Wei Li (D–F) & Fang Wen (B and G–L). Figure 3. 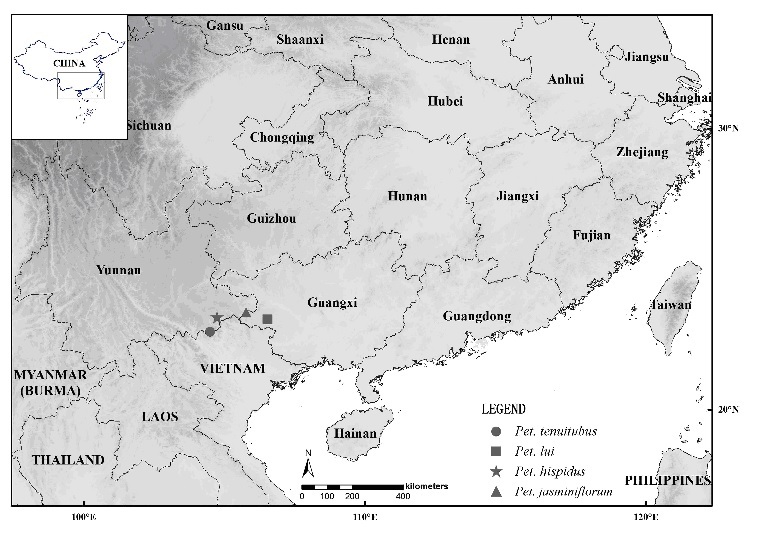 Distribution of Petrocodon tenuitubus (●) and its similar species, Pet. lui (■), Pet. hispidus (★) and Pet. 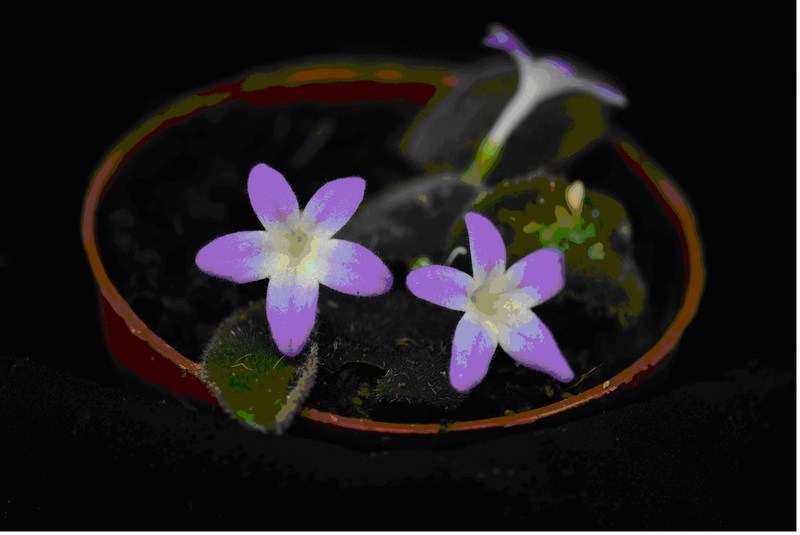 jasminiflorus (▲). (Wang 1990, Xu et al. 2010) Map designed using DIVA-GIS v.7.5 (http://www.diva-gis.org), data points plotted using ARCGIS 10.5.